Social responsibility and cultural values are central to Skansi Offshore’s strategy as the company takes delivery of its fifth new platform support vessel, with contracts for all vessels secured from major North Sea operators. 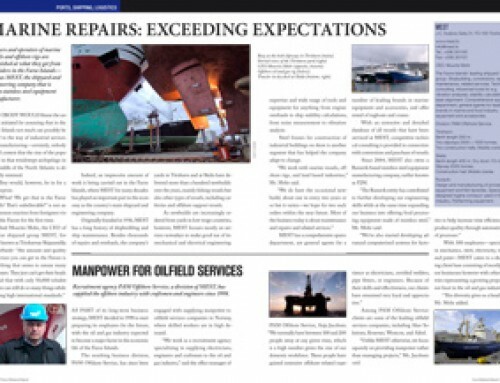 Skansi Offshore has been a remarkable story since its inception a few years ago. With the company’s first platform support vessel (PSV) delivered in 2009, and the fifth early this summer (2013), the pace of development has been high, especially in the last couple of years — the Saeborg came in September 2011, the Sjoborg in March 2012, and the Torsborg in June 2012. These PSVs are state-of-the-art vessels built to the highest specifications, with all of them except the latest one originally ordered by Skansi Offshore (earlier known as Supply Service). “For the first time since 2006, when we planned our initial order, we were going to operate the business without having a ship under construction,” said Skansi Offshore CEO Jens Meinhard Rasmussen. Then along came the opportunity to take over a shipbuilding order that had been placed with Havyard and was approaching completion. Constructed at the Leirvik shipyard in Sogn, Norway, the Havyard 833 vessel is designed by Havyard Group’s design branch in Fosnavaag. According to Mr. Rasmussen, Skansi Offshore has already secured a contract with BG Group for the 86.8 meter long PSV, which will head straight to work after delivery. Referring to the fact that this is the fifth Havyard-designed newbuild ordered by Skansi since 2007, Havyard Group CEO Geir Johan Bakke said: “We are fortunate to be part of this development stage of this ambitious shipping company from the Faroe Islands. With their background in fishing, Skansi Offshore has quickly developed into a competitive contractor of supply services to the offshore industry. From being somewhat of a small intruder they have through delivering good quality services grown to become a recognized contractor competing on par with the bigger players in this market. “We have learnt a lot during this process and we also believe we have contributed towards Skansi’s success by supplying good quality vessels. ‘A clear idea’: According to Mr. Rasmussen, Skansi Offshore secured three new contracts with Statoil, BP Norge and BG Group in December 2012, consisting of two five-year contracts in the North Sea with additional five-year options plus one contract for the duration of three exploration wells offshore Tanzania and Mozambique with an extension option of three more wells. The East Africa contract for the Eldborg is Skansi’s first assignment outside the North Sea — something that Mr. Rasmussen expressed satisfaction with in the face of toughening market conditions in the North Sea. Skansi’s noteworthy success in a highly competitive market may have something to do with the right mix of equipment, timing and above all, people. “From the outset we have had a clear idea of what we want,” Mr. Rasmussen said. For Skansi, there seems to be a clear connection between the idea of social responsibility and motivation in the workplace. 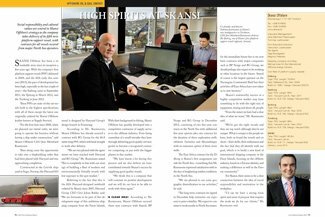 “I’d say we have a strong team spirit and sense of purpose that inspires the work we do for our clients,” Mr. Rasmussen said.